And FREE valet operating right in front of the store! Digitiqe is not your father’s stereo store. No salesmen in ties, no stuffy listening rooms and no holier than thou audiophile vibes... and oh, we don’t just sell stereos! Digitiqe is a place for all things tech, because that is precisely what makes sense to the newest generation of enthusiasts. We understand that tech today is one big web - almost all of our media is either on our computers and mobile devices or streamed through them. Digitiqe is truly a one stop shop, we sell headphones and speakers as well as all kinds of cool accessories and gadgets. We even have a great selection of turntables for folks interested in the old school, analog side of audio. Our Denver location is now an Authorized Apple Service Provider as well, which means we can repair Apple products both in and out of warranty. Our technicians are Apple certified and we use genuine Apple parts. Founded in Telluride as a one man IT consulting firm in 2005, eventually the company opened a store on Main Street. The HUB quickly established itself as Telluride's retail electronics destination as well as an expert service provider for locals and tourists alike. 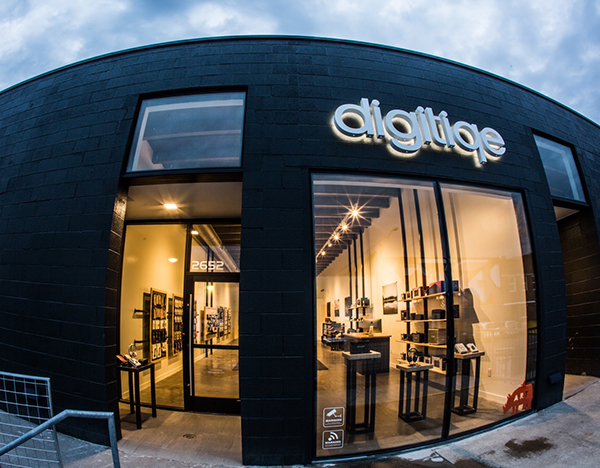 We expanded to Breckenridge in 2012 and began rebranding as Digitiqe on time to open our new, flagship store in Denver’s RiNo neighborhood in July of 2016. Digitiqe Denver is owned by Park Hill resident Kevin Byrne and his business partner and company founder in Telluride, Brian Werner. Together Kevin and Brian have decades of experience providing elegant solutions for all things technology.